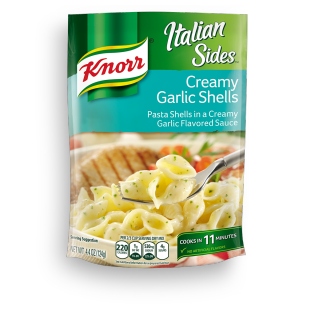 With our Creamy Garlic Shells Italian Sides, you'll be sure to get as much garlic, butter and Romano cheese-flavored sauce as your appetite demands. You can even pack in more great flavor by using it to make our Cheesy Mediterranean Chicken. Creamy Garlic Shells is rated 4.2 out of 5 by 53. Rated 4 out of 5 by Busymom4113 from Doublingredients the servings I love this flavor but one packet never seems to be enough for my family of 5. How can I successfully cook 2 packets at once. I've heard just doubling the ingredients does not work. Have you ever thought of selling family sized (larger) packets? Rated 5 out of 5 by ducatihottie999 from Aways the family favorite. We love this pasta! I have read some of the negative reviews. I disagree. I have been making and serving this product since it originated. It does thicken up. Unfortunately its near the time its almost cool. You must allow extra time after preparing to allow it to sit. My family loves this pasta so much we don't wait. I have perfected the thickening process by adding 2 teaspoons of corn starch to 5 tablespoons of water (well mixed) added at the end of the cooking process while still at a simmer. Rated 5 out of 5 by CricketJ19 from Creamy and Delicious This is one of my favorite pasta sides. We normally mix in vegetables and shrimp for a full meal. Rated 5 out of 5 by Emmie from My 2nd favorite This is another Knorr product that when I buy them, I buy 10 at a time. The comments here about the lack of thickening - well think it through. I would rather have the product a little bit runny right after cooking than have Knorr add some chemical or ingredient that isn't good for you added to thicken it more quickly. It is a natural product according to what I've read and I hope they keep it that way. There are so many quick and easy products out there and most make me sick. Not a single one of Knorr's products have ever made me sick.